HE Silos commenced operations in 1969 and was then known as Hillston Engineering, located Hillston NSW. Originally a general engineering company, the business direction evolved into the agricultural industry through projects such as machinery and shearing sheds as well as the commercial grain storage complexes. ‘In 1972 the company moved into the construction of grain silos and in 1984 the company relocated and opened a dedicated plant in Forbes. The company expanded and opened a factory in Gunnedah NSW in 1997, Forbes opened a new transportable factory in 2005 and more recently in 2017 a new factory was opened specifically designed to manufacture large capacity silos (onsite) in Gunnedah NSW. The management team behind the organisation include Ivan and Patricia Morrison, sons Darryl and Steven, daughter in laws Cherylee and Jennifer and now third generation their children. The factories at Forbes and Gunnedah employ up to 70 staff. In January 2006 Ivan and Patricia retired from active involvement in the company, they can be still found around the factories from time to time. The Forbes factories and Gunnedah factory have remained family owned and operated. Darryl, his wife Cherylee and their children operate the Gunnedah Factories while Steven, his wife Jennifer and their children operate the transportable factory in Forbes. 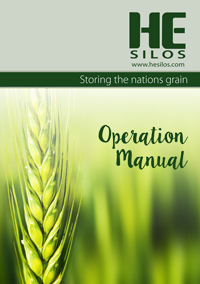 It is significant that all of the roll forming machinery for both factories was designed and constructed by HE Silos. This fundamental understanding of process, a sound grounding in engineering and the adoption of the best technologies and construction practices results in a well sorted and efficiently made product. Now constructing silos from 4 tonnes to cone base designs up to 500 tonnes and flat bottom units up to 1000 tonnes. HE Silos manufacture ranges of products from Kit Silos, Superphosphate silos, 60 degree cone silos, field bins, cattle and sheep feeders.